The functionality of the transmitter IPAQ 330 is being extended to also offer wireless communication via NFC® and Bluetooth®. IPAQ 330 is the second transmitter after the IPAQ 530 to be part of the wireless concept that offers a new way of configuring and monitoring transmitters, without power supply and cables. 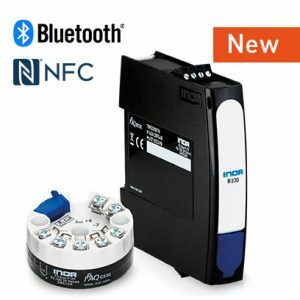 Connect to the transmitter via NFC® or Bluetooth® and configure through the app: INOR Connect. All you need is a smartphone or tablet. IPAQ 330 is a modern temperature transmitter developed to meet the highest requirements on flexibility, accuracy and reliability. A universal transmitter compatible with RTD, thermocouples, voltage and potentiometer sensors to offer high flexibility and reduce the number of installed product variants. IPAQ 330 is available with ATEX, IECEx and cFMus certifications, making it a safe choice for a wide range of applications. IPAQ 330 is a highly reliable and robust temperature transmitter. External influences such as ambient temperature, vibrations up to 10 g, moisture and EMC interference have minimal influence on the measurement result. Packed with our most advanced technology, IPAQ 330 gives you better control over your process. Smart features such as password protection, simulated output, data logging, runtime counter and customized linearization, facilitates your daily work. Configure your IPAQ 330 wirelessly via NFC® by using the new app INOR Connect. The fast communication between the transmitter and the smartphone makes it possible to copy and paste a configuration to as many transmitters as you like and it only takes seconds. Add the ICON-BT modem and you can configure and monitor your IPAQ 330 also via Bluetooth. Thanks to the extended range that Bluetooth offers you can monitor the transmitter remotely.